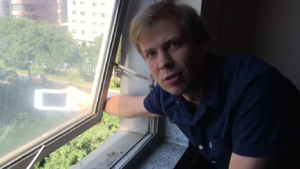 Living on the 20th floor of a high rise building isolates people from the world. Cars, streets, shaokao vendors—they’re all farther away. 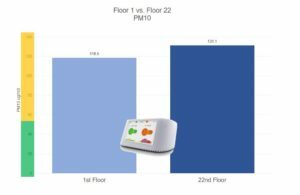 So does that mean PM2.5 is lower on the higher floors of buildings? 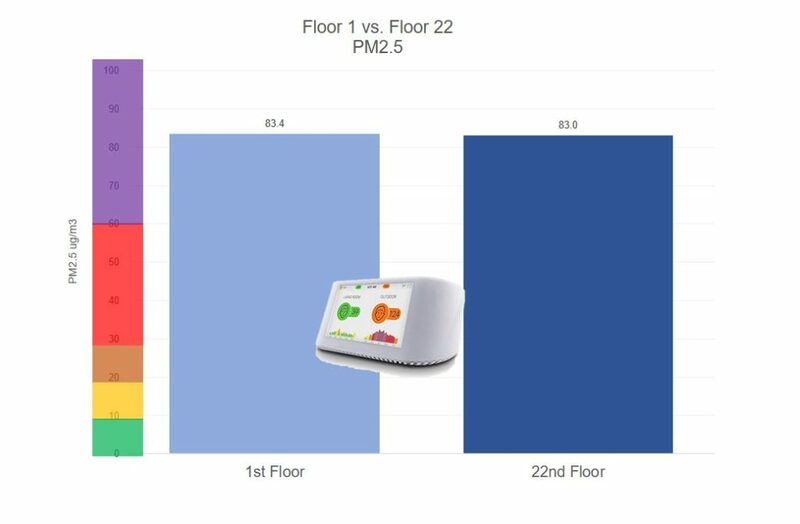 Tristan from the Smart Air team tested this by taking laser particle counters from floor 1 to floor 22 of an apartment building in Chaoyangmen, Beijing. 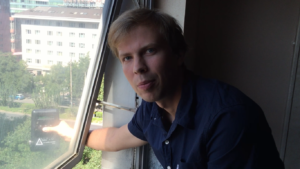 Tristan tested on two polluted summer days. 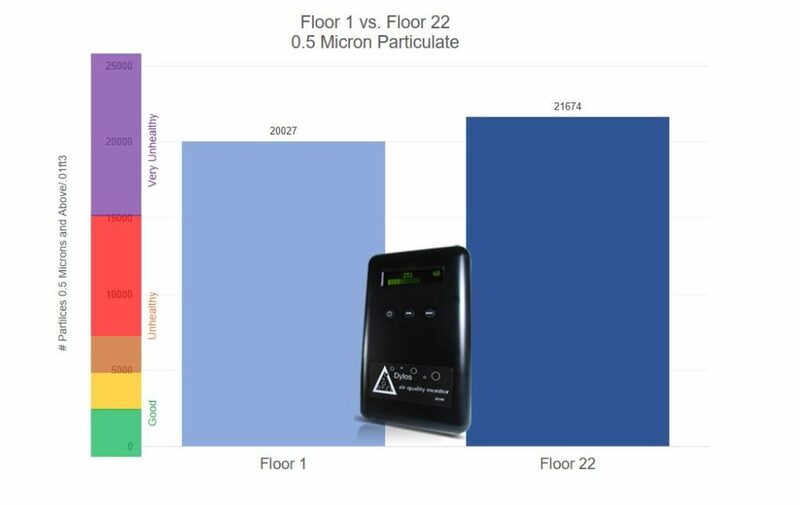 The World Health Organization’s 24-hour PM2.5 limit is 25 micrograms. Tristan measured 207 micrograms on day 1 and 84 micrograms on day 2, so these were polluted days. Tristan brought the Air Visual Node and the Dylos DC1700 laser particle counters and took measurements at every hallway window in from floor 1 to 22 and all the even-numbered floors in between. Tests have found that the Dylos and Node correlate highly with the US Embassy PM2.5 readings (r > .90). First we looked at the smaller particles, particles 0.5 microns and above. 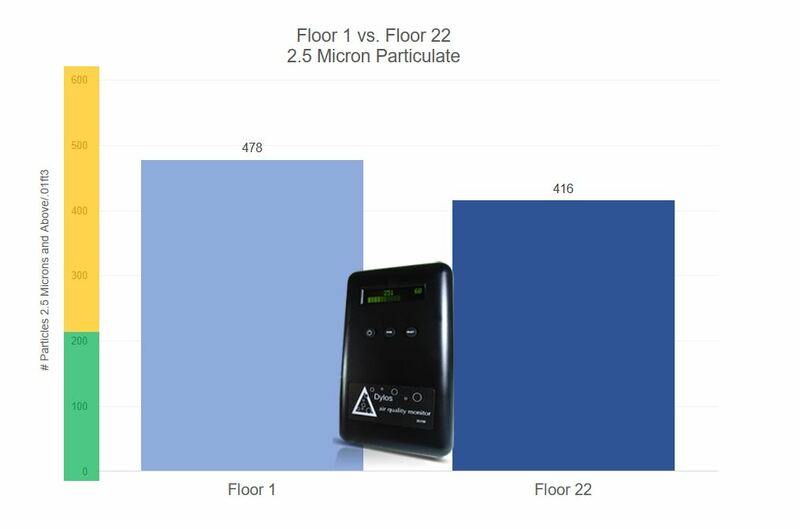 We did the most drastic comparison: was particulate lower on the 22nd floor than the 1st floor? So there weren’t clear differences in the small particles, but what about larger particles above 2.5 microns? Perhaps this sort of dust is lower on the higher floors because it settles faster than small particles. But averaging floors 1-10 versus 12-22, higher floors had a slight advantage for these large particles. 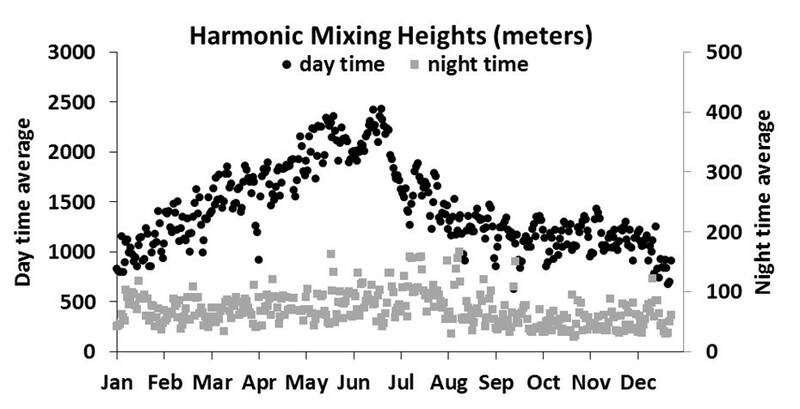 Higher floors had 3% fewer large particles on day 1 and 10% fewer on day 2. Even if we stretch all the way up to the 30th floor, that’s still just 93 meters high. To get to 400 meters, we’d need to live on the 129th floor. For now, we earth-dwellers can’t hope to outclimb pollution.